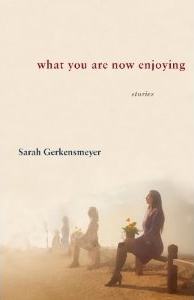 Sarah Gerkensmeyer’s stories inhabit an alternate universe, so close to our own, that for the first few paragraphs of each story you think you know where you are, but quickly the off kilter, not what you thought, creeps in and nudges you. This entry was posted in review, short story and tagged Sarah Gerkensmeyer, Short review, what you are now enjoying by Cherry Potts. Bookmark the permalink.